Dante's Plato Citations in "Commedia"
The three Plato citations & one Timaeus citation in Dante's Commedia were located using Wilkins' A Concordance to the Divine Commedy of Dante Alighieri (Harvard University Press, Cambridge, 1966). Allen Mandelbaum's translation (1980) with Italian text is available at Columbia University's Digital Dante web site. 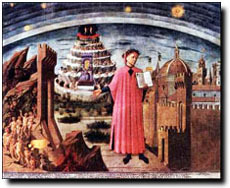 The Latin and English texts of Dante's Epistle to Can Grande were provided by James Marchand of the University of Illinois. and said no more, remaining with his sorrow. since it would seem that as he speaks he thinks. intending something not to be derided. For we see many things with our mind for which vocal signs are lacking, as Plato tells us well in his books by taking on metaphors, for he saw many things with the light of his mind which he was not able to express in his own words.